One of the key areas for Search Engine Optimisation (SEO) is referred to as “on page” optimisation or “on page SEO”. This term simply encompasses those factors within a website and its web pages that contribute to its organic placement and rankings. While on page are not the only factors affecting your organic rankings, they are an important contributor so getting them right will help and of course support any other SEO initiatives you’re undertaking. Content is your ace card and having rich unique content that’s appealing and relevant is key to success. Doing keyword research will help you understand what phrases people are searching on and therefore what you should incorporate within on page copy. 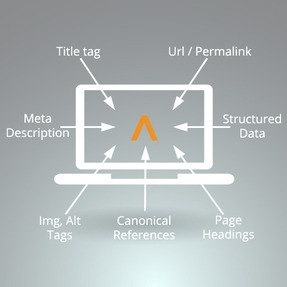 This keyword research is important to many aspects of in-page optimisation. As I kicked off this article, what I’ve covered is not the exhaustive list of elements that are part of the on page optimisation however they provide you with a great place to start and will help you along the optimisation path. Remember, content is the key, making it unique and compelling and getting users to share and talk about it (in the online space) is important. As Google states: “build your pages for the users first”.